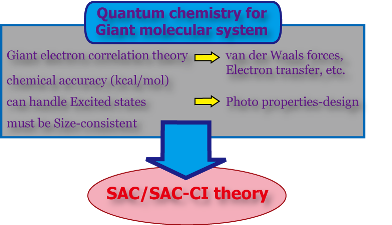 We are developing SAC/SAC-CI method applicable to giant systems like molecular crystals and biological systems. Based on the view point that the entire system is the aggregate of local systems, truly large systems become our computational target. As applications of this method, we want to clarify the excited state of the molecular crystal, the role of protein in biological reactions, and the solvation effect in chemical reactions which sometime becomes essentially important. Symmetry-adapted-cluster/symmetry-adapted-cluster configuration interaction methodology extended to giant molecular systems: Ring molecular crystals, H. Nakatsuji, T. Miyahara, R. Fukuda, J. Chem. Phys. 126, 084104 (2007).